We've had a thing for Kennedy Ryan and her novels for years now and after we read Flow and Grip, we were thirsty for more information. No lie, as soon as I finished reading Bristol and Grip's story I got in touch with Kennedy and asked her if she'd be willing to answer a few questions; I couldn't get enough and had to know more about anything and everything involving the making of Flow and Grip. 1. When you first conceived of this novel, what was the first scene you envisioned? I’ve been thinking about Grip and Bristol for a long time, so I have to sort through my creative process to see what was first and most clear. I think probably the scene on the roof early on in the book. It is their first scene together in the book, (not counting the prologue), and orients us to what the last six years have been like. It establishes the arms length Bristol needs to keep Grip at, and the fact that he still very much wants to be much closer. It also establishes a simmering sexual chemistry between them. I think my favorite thing about this chapter/scene is that it establishes that they are still friends. That the glimpse we had of their honest conversation and authentic connection in FLOW has carried over throughout the years. 2. What were the challenges in writing this novel--I'm thinking content related type challenges, if there were any? Wow. Where do I begin? LOL! This was the hardest book I’ve ever written. 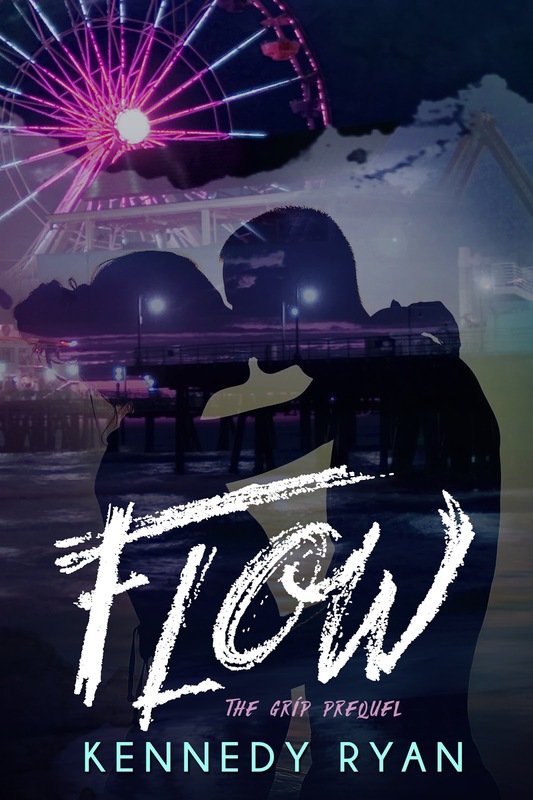 I basically wrote FLOW, the prequel, and GRIP at the same time. I would literally have both documents open and go back and forth between them. I had a few timelines I was juggling, and they kind of started feeding on each other. I would think of something while writing Grip that would have been neat, and then go back to the past and make sure to include it in FLOW. The greatest challenges were negotiating the issues that would be potentially divisive. Most of those centered around race, like the conversation Grip and Bris have regarding the “n” word. The tensions between law enforcement and communities of color, specifically the scene where Grip is stopped DWB, driving while black. And the dinner scene where Grip’s mother and cousin express their objections to Grip being with a white woman. These are scenes I re-wrote, revised over and over. Literally five, six, seven times. My betas had to be tired of reading the same scenes again and again. I wanted to get it right. These issues could so easily have become divisive if not handled carefully, responsibly. I wanted to provoke people to think from another perspective, to consider things they hadn’t before. Someone walking away from this book angry or defensive would have been a fail for me. Readers walking away thinking, feeling challenged, even uncomfortable, but thinking was a win. And I was willing to rewrite as much as I had to for that to happen. It took me about 5 months to write Flow and Grip, but I started the music playlist and Pinterest board about 9 months before the book was done. I think and research and…dream a lot before I actually start typing. 3. What are you proud of (or love) about this novel? 3 1/2. When readers finish reading this novel, what do you hope they walk away with? Several things. I hope they walk away with a love of poetry, or at least an interest they may not have cultivated before. I’ve had so many readers tell me they ordered Pablo Neruda books after they read Grip. Neruda is Grip’s favorite poet, and he references him several times throughout both books. I love that because poetry is my first love, and it deeply influences my writing style. The possibly polemical issues I referenced before around race – whichever side readers may stand on, I want them empathizing or at least considering the perspective of someone else. Of someone on the other side of that issue. The thing I love about Grip and Bristol’s conversations was that they didn’t always agree with one another, but they heard each other out. They respected each other. And they wanted to understand, even if they still didn’t agree. I hope that models something for people when they find themselves politically or ideologically opposed to another person. 4. In a word how would you describe Bristol? Grip? Gosh. ONE word? Um….I would describe Grip as…passionate. From how he expresses himself through poetry, to how he loves Bristol unwaveringly. He feels things deeply, as many creative do, and I love that he isn’t afraid to express the depth of those feelings. Bristol I would describe as fearless. She says that her love doesn’t have limits; has no ceiling or floor or boundaries. That is who she is, how she cares about people, and everything finds its roots there, even how hard she works. And nothing will harm the people she cares about if she can help it. 5. Favorite Neruda poem? Hughes poem? Any other poet recs? 6. Do you see a future for any of the secondary characters in future books? Thank you so much for taking the time to answer these questions, Kennedy. We are very excited about all the projects you're working on. FLOW is the prequel chronicling the week of magical days and nights that will haunt Grip & Bristol for years to come. ***Make sure to read the prequel FLOW, which is included, before starting GRIP. Kennedy loves to write about herself in third person. She loves Diet Coke…though she’s always trying to quit. She adores her husband…who she’ll never quit. She loves her son, who is the most special boy on the planet. And she’s devoted to supporting and serving families living with Autism. And she writes love stories!